Kickboxing is back by popular demand, packing just as much of a punch as before. A survey by Fitness Activities showed students wanted kickboxing back, said Lisa Robison, a fitness activities advisor at BYU-Idaho. There are nine different fitness classes available at 41 different times throughout the week. Kickboxing, taught by Emma Nelson, a sophomore studying psychology, is one of those nine classes and is offered every Tuesday at 9 p.m., in the John W. Hart building room 234. These classes allow students to get out and get involved with the things that BYU-I offers on a daily basis, Robison said. Nelson said the classes provide the needed stress relief the exercises performed. “It is just all around better for you if you can find some sort of physical outlet,” Nelson said. Nelson said the kickboxing class provides a workout targeting all the muscles groups for a complete workout of your lower body, upper body and abs. “Kickboxing is more focusing on combat moves. You use a lot of boxing moves, like punches and kicks, but not with a bag or equipment, so you don’t have to be in a certain facility for it,” Nelson said. Nelson said you don’t have to have any previous experience. Someone with no experience, or with a lot of experience can equally enjoy the class. 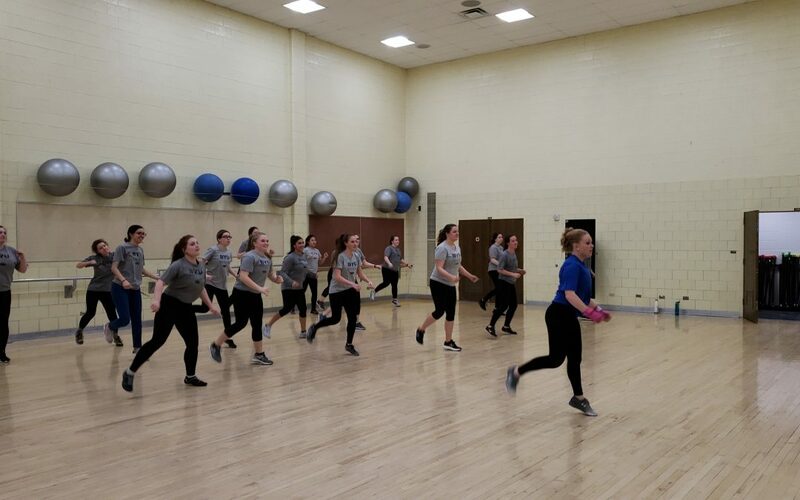 “We hope that the fitness classes are more of a welcome safe environment that they can challenge themselves at their own fitness level,” Robison said.